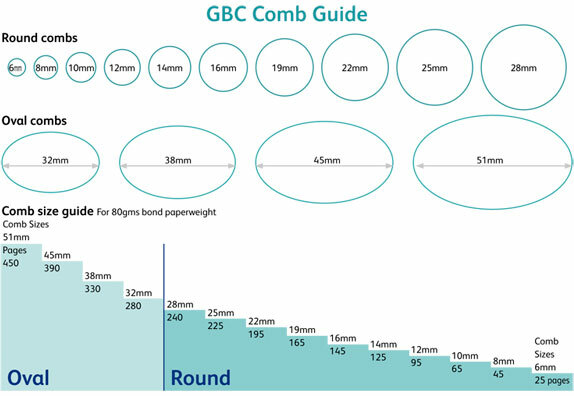 What size comb do I use? Bank/Credit card statements/Client lists/Customer details/Utility bills/Accounting records/Letter head paper/ Tax returns/Medical records/Compliment slips? Salary details/Financial/sales reports. What are the different binding styles? 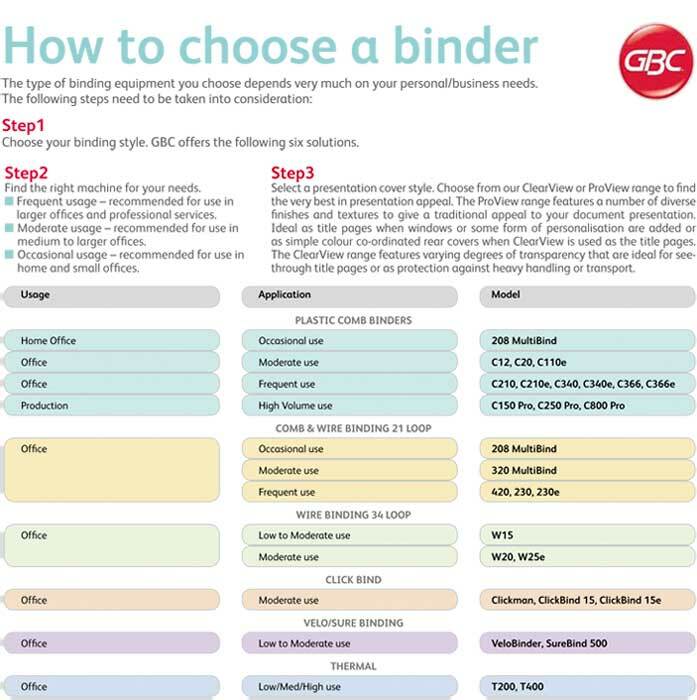 How to choose a binder? 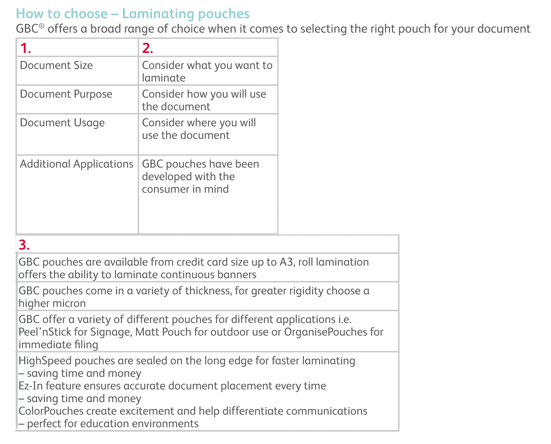 How to choose - Laminating pouches? 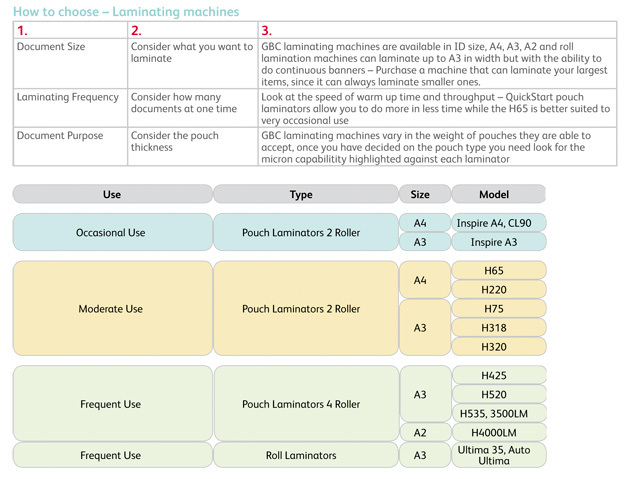 How to choose - Laminating machines? UNDERSTANDING COLOUR AND THE BASIC COLOUR WHEEL? The 3 basic colours are called primary colours. These are ‘pure’ colours (in other words, they cannot be mixed from any other colour combination). Between the primary colours, you find Orange, Green and Purple. These are called secondary colours. They are made up by mixing equal parts of two primary colours. By mixing any primary colour with an equal part of the secondary colour next to it, you create tertiary colours and increase the basic colour wheel to 12 colours. The 12 colour wheel, consisting of 3 primary colours, 3 secondary and 6 tertiary colours is the most useful way to get to know your colours. colours tend to be vibrant and jump forward. tend to be calming and soothing on the eye and tend to recede. A picture painted in all warm or all cool colours will be dull and flat. All paintings need to have a balance of warm and cool colours. For example, the background should consist of a cool colour while the picture is a warm colour, this will tend to stand out better. These colours appear opposite each other on the colour wheel. The importance of complimentary colours, lies in the way the colours react to each other. If you place complimentary colours next to one another, the one colour intensifies the other. Red looks redder next to green, blue more vivid next to orange and yellow much brighter next to purple. 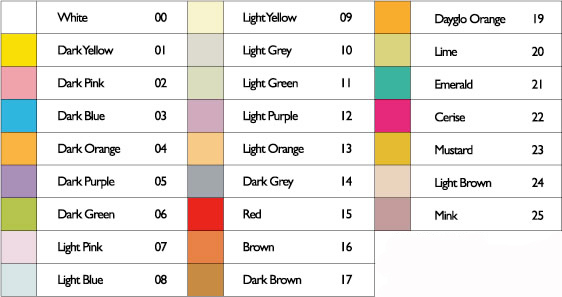 When any PRIMARY colour is mixed with an EQUAL part of it COMPLIMENTARY SECONDARY, a grey or brown is produced. Example - Red + Green = Dark Brown By varying portions of colour, you can produce a range of subtle tones which can vary from a cool grey to a subtle brown. Example - Red + Green + Lots of yellow = Mustard. Try it for yourself, using any colour from the colour wheel. Colour is a very personal thing. Some people opt for vibrant colours, while others choose more subtle colours. Whatever, your choice, experiment with various shades and always write down the colours you have used, as you will not always remember, should you wish to paint the same colour again. IF IN DOUBT JUST LOOK AT NATURE! How to remove Liquid Tempera stains? Dala unfortunately cannot guarantee that the following procedure will be successful for all stains caused by powder or liquid tempera. This process contains invasive materials and could harm or destroy your fabric so please test on a sample swatch or on an inconspicuous part of the garment. The procedure contains hazardous materials and should not be attempted by children. 1. Scrape of the dry or wet excess paint. 2. Soak the fabric in warm water. Add 10 ml of vinegar and a 5 ml of liquid dishwasher per 1lt of water. Soak for 30 min agitating occasionally. 4. Apply alcohol to the stain and to a piece of absorbent material. Place the material over the stain. Keep the material in place as long as it absorbs the colour and replace the material with a fresh peace if it becomes saturated with colour. It is important to keep the stain and the material constantly moist with the alcohol. 5. Clean of the alcohol and allow it to dry. 6. Soak it again for 30min in warm water 5 ml of dishwashing liquid and 10 ml of ammonia per 1 litre of water. 7. Rinse and allow to dry. If a stubborn slight stain still remains, make a solution of 5 ml bleach to10 ml water. Apply this solution drop by drop to the stain. Do not leave the bleach on your fabric for longer than 2 min. Rinse in warm water. Apply vinegar to the area and rinse again with water. Some fabrics cannot tolerate chlorine bleach so please test on a sample swatch or on a inconspicuous part of the garment. Dala Craft Glue is a premium, multi purpose craft glue. It is a polyvinyl acetate (PVA) that dries, without the addition of heat, to a tough, non-visible film. Dala Craft Glue is suitable for most hard and soft woods, processed board, cardboard, paper, stone, leather, felt, cloth, cork etc. This glue is ideal for school projects, DIY jobs and all your art and craft endeavours. Simply mix Dala Craft Glue with one of your favourite Dala Powder Paints for a great finger paint. Ensure that the surface is clean and free from dust and grease. Apply the craft glue to one or both surfaces. Clamp together for a minimum of one hour. Allow at least two hours drying time before handling. The bond can be improved by increasing the clamp time ï¿1⁄2 for a truly secure bond, 8 hours is recommended. Clean excess glue from the joints with damp rag before glue begins to dry. Wash hands in water. What is Acrylic Drawing Ink? As an ink for dipping pens. As a paint for air brush techniques. As an opaque or transparent wood stain. For detail on acrylic works. For colouring ‘cracks & crevices’ in textural works. is added to art works, we move into the area of SCULPTURE. The most common introduction material when attempting sculptural works, is CLAY. There are two major techniques when working in sculpture. The first is to ‘build up’ - to manipulate or model the media (clay, or papier mache) into the form that you want. A wire (florist wire or pipe cleaner) can be used as an armature to provide greater strength to support the form you are shaping. The second is to ‘cut away’ - to reveal your desired form from a larger bulk of your media (wood, stone, clay, etc.) Here one would carve, scrape, shave or cut excess material away, to leave behind the form you wish to create. Most clays are relatively soft, and so they are most commonly used for building up forms. One can use tools (anything harder than the clay can become a tool) or simply manipulate the form with one’s hands. TEDDY and DALA manufacture a range of clays for different age groups and uses. For the younger children Teddy has a range of basic colours, and in MISS TEDDY, some pastel shades, of a very soft flour based modelling clay which is easy to manipulate. One can mix these with each other to form marbled clay or new colours. It sticks to itself, so no glue is needed. It is completely non-toxic and will not discolour your skin. Unlike Mom’s home recipe, this clay will bounce and is far more elastic, and it is re-usable (for a considerable period) if it is put back into a plastic bag and re-sealed. If left out to dry it will become harder. Teddy has recently introduced two soft, easy to use light weight clays. The first is called CRAZY CLAY, a smooth almost weightless clay which is ideal for making forms that can be suspended on eg. florist wire without making them bend – great for models of an atom or the universe. They can be mixed to form many more than the six colours that come in a pack. They can also be stuck onto 2-dimensional surfaces to create shallow relief work, without being heavy. The second one is called FUN FOAM, and it contains thousands of miniature polystyrene balls, making it a textured light weight clay. Both the light weight clays will slowly air dry if left out of their packaging. Although aimed at children, it has been discovered by crafters and fine artists as a useful addition to the textural craze that is sweeping the art world. It too can be stuck onto flat surfaces, even canvas, to create light weight 3-d solutions. Modeling clay (some will remember this as ‘Plastecine’) is not as soft as playdough, but can still easily be manipulated with one’s fingers. It is pre-coloured, and can be mixed to create more colours. It is glycerine based, so it remains moist, pliable and re-usable for a long time, but will eventually air dry if left out indefinitely. There is less shrinkage when dry in modelling clay than in any of the water-based clays. Older children (7+) will prefer this to playdough, as it is more solid. Slip To join two pieces of pottery clay together, particularly if it is a little dry already, make a slip! This is a paste made with some of the clay and extra water. Roughen the areas to be joined, paint on some slip, and press the two wet sections together. The slip acts as a glue to strengthen the join. Although Dala does not make a pre-packaged papier mache, one can easily make it by adding any form of easy-tear paper (newsprint, toilet paper, roller towel, light card) to Dala Gel Medium to make an excellent papier mache. Either paint it directly onto eg newspaper to stiffen it, or let paper soak in water till it is a pulp, and then add Gel medium as the binder. What is Dala Texture Paste and how do I use it? In recent years there has been a growing appreciation for texture in many fields - architecture, fabrics, art & décor. In fine art & décor there has been a swing away from carefully painted recognizable images, to textures created with mixed media and paint smeared onto surfaces with heavy body paint. Some companies are producing ready-made heavy body paints (Dala will launch a range shortly) but by far the most popular method is to thicken existing paints with a neutral heavy body paste, to create impasto effects. sensitive. It will dry (24 hrs is best) and retain the sharpness of whatever shapes were create when it was applied. Brushes do not work well, but any object harder than the texture paste becomes a tool (painting knives, combs, plastic, cardboard, the back of the brush, etc.) It is smooth and flexible, and artist;s quality - it will not flake off after drying like Polyfilla or cheap substitutes. Dala’s ready-made coarse paste has been machine blended to give it an excellent even consistency, which dries to a slightly grey shade, and will keep its shape when cured. and sanded when dry. It is however possible to create texture with various tools while it is still wet, and it has become very popular for texture, even with water colour artists. Texture paste can be applied as is, and then painted when dry, with any type of paint, even oils. It is also possible to mix colour into the pastes before applying. If the paint has a strong pigment it is still possible to achieve strong colour in the paste, but avoid metallics as the paste causes them to lose their sheen. Metallics can be over-painted when the paste is dry. They stay wet long enough for beginners to play around, scrape off & re-apply several times before they are left to dry, so experimentation is possible. When applying really thick layers it is a good idea to build them up (no more than about 1.5cm at a time, as it is important to give the paste time to dry properly) in several stages. They will be effective on most surfaces (rough is better) unless the surface is extremely smooth, or greasy / waxy or oily. Recently several effective experiments are being done with Dala’s Glass Stains on texture pastes, and it is also possible to embed whatever textural objects you want to apply into the wet texture paste, or between two layers of transparent Gel Medium. (Let bottom coat dry and hold objects in place before ‘laminating’ with a second transparent layer of Gel Medium. Interesting crack effects can be created by over saturating the paste with China Clay. It will still stick to the surface you apply it to, but as it loses surface tension it will cause cracks to appear when drying. The whole field of textural mixed media is still very open to new ideas and experimentation, so try whatever seems like an interesting possibility and you are sure to come up with something completely original. Have fun! Pencil lead is made of a mixture of graphite and clay. The graphite is the part that makes the dark mark on the paper. The clay is there because graphite on its own is far too soft and crumbly to write or draw with. Thin leads for mechanical pencils are similar, but with a polymer or resin taking the place of the clay. Wooden pencil leads also have a little wax or grease added for extra smoothness. In mechanical pencil leads, this is replaced with oil. The grade, or hardness, of a pencil is due to the proportions of graphite and clay (or polymer/resin). More graphite makes for a softer lead, and more clay makes for harder lead. When you're actually using a pencil, you want it to make marks on paper. The softer the lead, the darker the marks it will make. Artists often use a range of different pencils for a single drawing, switching to a harder lead when they want light shading, and a softer lead for darker areas. Here in Africa and Europe, we have one system for both art pencils and office pencils. The middle ground is referred to as HB. Softer lead gets a B grading, with a number to say how soft the lead is. B on its own is just a little softer than HB. 2B, 3B and 4B are increasingly soft. Further up the range, 9B is the very softest lead available, but so soft and crumbly that it's rarely used. Anything over 4B is probably too soft for most people's day-to-day use. Harder leads than HB get H ratings. In the same way as with the B ratings, the numbers go as far as 9H, but few people need anything that hard. There is an extra grade used by some manufacturers, between HB and H - an F grade, for 'Firm'. For art and drawing pencils, Americans use the same system. For office use, they often use a different system, with just numbers. A #2 pencil is the same as an HB, with lower numbers for softer pencils and higher numbers for harder. This numbered system only covers a range from B to 2H - enough to cover most office use, but not enough range for drawing and sketching. ABS plastics - Acrylonitrile butadiene styrene. Is a copolymer made by polymerizing styrene and acrylonitrile in the presence of polybutadiene. Abs combines the force and firmness of the acrylonitrile and styrene polymers with the toughness of the polybutadiene rubber making it very strong, hard and durable through a broad range of temperatures. They are highly versatile plastics and bond together well using either adhesive or solvent cement. They are used to make panels for refrigerators, musical instruments and equipment cases, food trays, belt guards, covers and storage bins. What is the difference between the Dala Paint Brushes? Dala has 2 kinds of brushes. All Dala brushes can be used with all Dala paints. Sugar Paper aka Construction paper is a tough, coarse, colored paper. The texture is slightly rough, and the surface is unfinished. Due to the source material, mainly wood pulp, small particles are visible on the paper’s surface. It is used for projects or crafts. Ballpoint pens use an oil based ink in which pigment is suspended in oil. The ink is dispensed at the tip by the rolling action of the ball and dries almost immediately after contact with paper. Inexpensive, reliable and maintenance free, the ballpoint has replaced the fountain pen as the most popular tool for everyday writing. Ballpoints require more pressure to write and lack the free flowing supply of ink. All Pilot ballpoint pens have stainless steal tips that house the tungsten carbide ball. The ball keeps its round shape ensuring the line remains precise and regular, without blotches or leaks. What is a gel ink pen? Gel ink pens use ballpoint writing mechanisms with an ink in which pigment is suspended in a water-based gel. The gel ink is in a solid state inside the refill but turns liquid from the friction generated heat of the rolling ball. Once the ink cools down on the paper, it becomes solid again. Gel ink provides the user with smooth, effortless writing with vivid colours and no blobbing, and because the ink is thick and opaque, it shows up more clearly on dark surfaces. Gel ink is acid free and archival safe. What is a rollerball pen? Rollerball pens use ballpoint writing mechanisms with a water-based liquid ink. The rollerball pen was designed to combine the convenience of a ballpoint pen with the smooth, wet ink effect of a fountain pen. The characteristics of these less viscous inks gives them distinctive writing qualities i.e. Ink saturates more deeply and widely into paper. What is a hi-tecpoint pen? Hi-tecpoint pens have a unique stainless steel, needle point tip that uses 3 or 4 dimples to support the ball. The advantage is the ball is supported by the dimple points thus reducing the wear surface and allowing a smoother rotation of the ball. Hi-tecpoint pens use liquid ink. How does the erasable Frixion work? 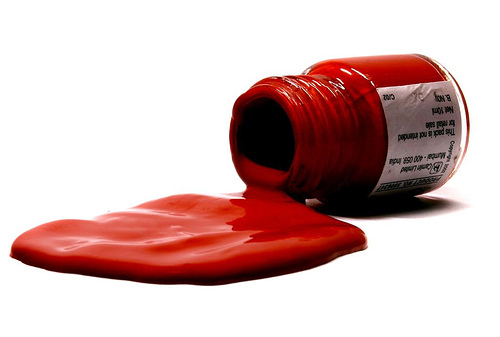 Frixion ink is a unique, thermo-sensitive ink that reacts to heat. When the ink becomes hot, it goes invisible. When it is cool, the ink comes back. The plastic tip (eraser) on the end of the Frixion pen generates enough heat through friction when rubbed against the surface of the paper. To get the ink to reappear again, place the paper in the freezer for a few minutes. Keep in mind that because the Frixion ink is thermo-sensitive you should not leave documents or pens exposed to heat for a prolonged period of time. Never use Frixion for signing legal documents or cheques. What are the different technologies used in the different Pilot pens? ATT System - Air tight and through system. This system keeps the pen tip air tight and through by an ingeniously adjusted spring and pen tip holder. This ensures no dryness of the pen point, ink blotching or ink leakage leading to instant writing starts every time. ATT is used in Pilot Rollerball, Hi Tecpoint and Disposable Fountain pens. Ink Regulator - Any excess ink flow from the ink reservoir while writing is stored temporarily in special pen core by capillary action. This ensures stable and constant writing supply to the last drop. Ink regulator is used in Pilot Rollerball, Hi Tecpoint and Disposable Fountain pens. TPF - The Twin Pipe Feeder System provides a stable ink control by utilizing 2 pipes and a reservoir. Of the 2 pipes, one is to supply the ink to the reservoir and the other is to send air to the ink tank. TPF is used in V Board Master (Whiteboard Marker) and V Super Color (Permanent Marker). How do I remove permanent marker stains from the wall and timber door? Generally it is better to use Ethanol (Ethyl Alchol) which is a solvent to dissolve oil based ink. Thinner or Benzaine can also be used for removal of stains, but they are stronger than ethanol and they may damage material. In the first instance use a cloth soaked in Ethanol first and wipe up the ink stain carefully. If this is unsuccessful then try thinner or Benzaine. 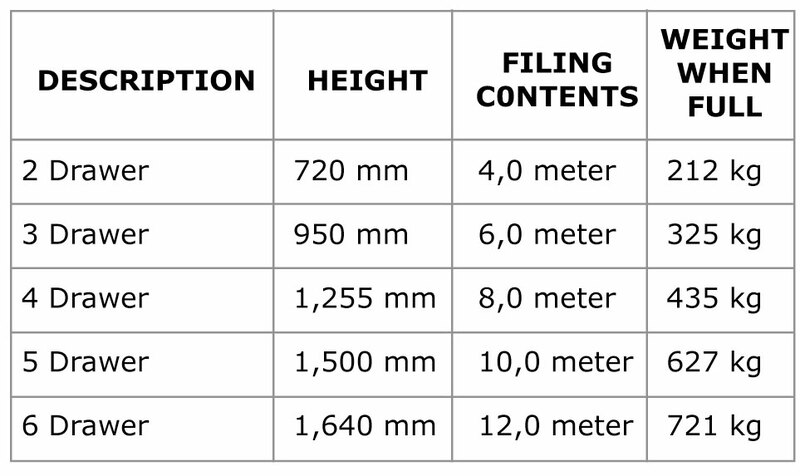 Understanding Staple Sizes - Wire Gauge & Shank Length. 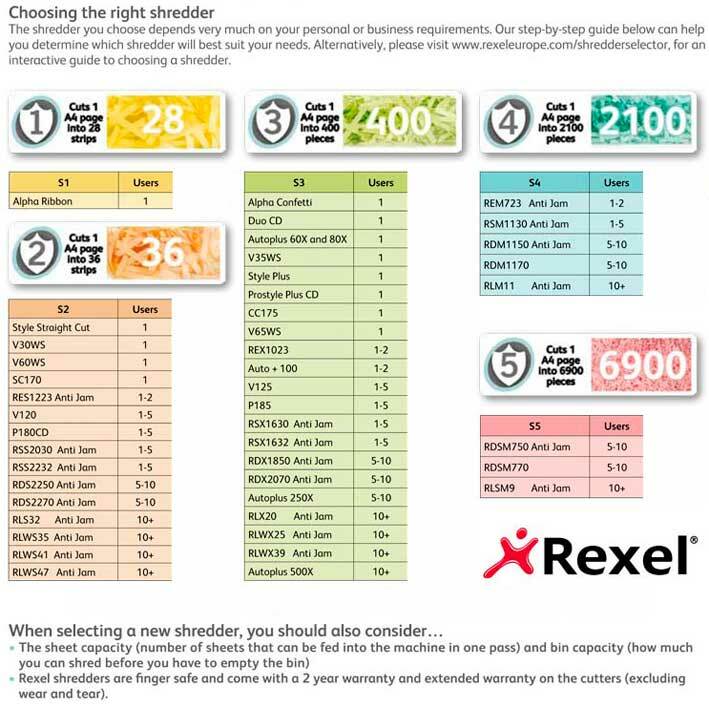 The key to understanding how staples are sized is easy – it’s all about simply knowing what the numbers in the size represent. The two numbers used in international staple sizing are the gauge of the wire and the length of the staple shank, given in millimetres. A lower wire gauge number means a thicker staple, while a higher shank number means a longer leg. 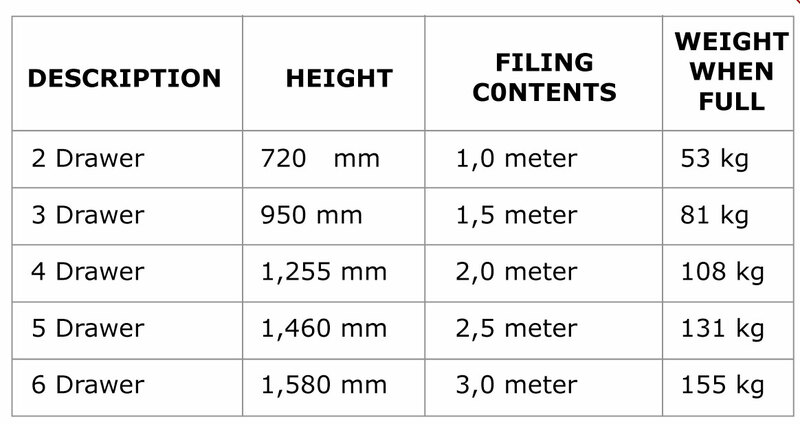 The most widely recognized standard for staple sizes reads wire gauge/shank length, such as 23/8, for example, where the gauge of the wire (23) is the former, and the shank length (8 mm) is the latter. One example of an exception to this rule is the standardized size No. 10 staple, which is used for mini staplers. Heavy duty staplers range in purpose from holding together thicker packets (25 pages or more), to fastening boxes or various industrial purposes. Typical staples sizes for these purposes are 13/10, 13/14, 23/12, 23/15 and 23/24. 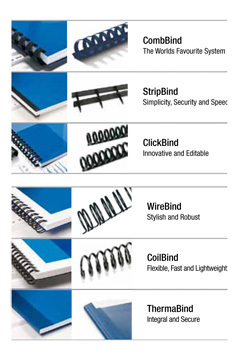 Household or classroom and office staples are the most commonly used type. 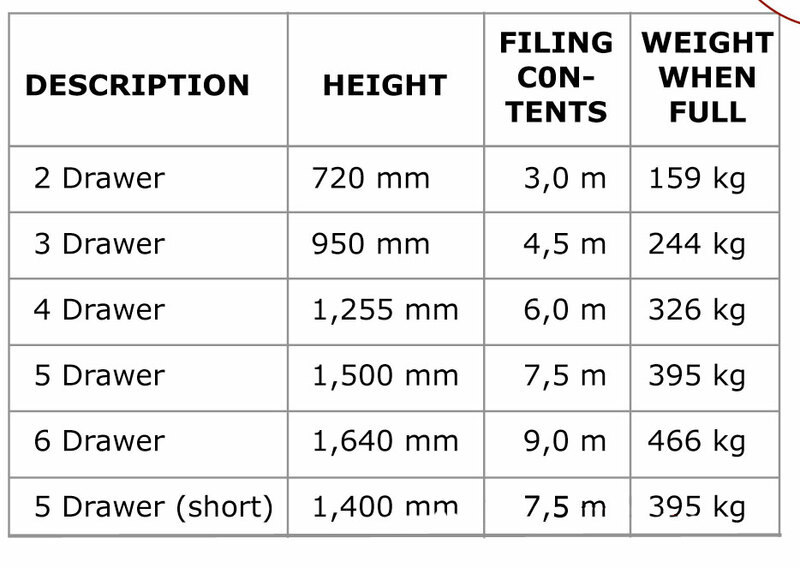 Some of the more commonly used sizes are 13/6, 13/8, 24/6, 24/8 or 26/6. These staplers are usually used to fasten packets of twenty five (or fewer) pages together, or to hold just a few pages to a bulletin board or wall. Before purchasing staples, always check the stapler that will be used for a specific staple size that may be stamped inside the cover or on the base. If so, use the manufacturer’s recommendation for the best stapling performance. Why are Pilot Whiteboard markers so unquie? It could be that your printer is default set on Letter format when it needs to be set on A4 format seeing as these are A4 labels. I use Microsoft Word and experience the following problems. Click on ‘Tools’, scroll down to and click on ‘Options’. Click on ‘General’ tab and choose ‘centimetres’ at ‘Measurements Units’. Alternatively place ‘cm’ after typing in each label dimension. I have installed the Template Disk, but the main window remains blank after I have chosen the correct template. What’s wrong? What are the features and benefits of using Tower Labels? What A4 Printable Tower Products, does Bamm offer? Bamm offers the following products. Before you print onto a sheet of labels, first print onto a blank A4 page of paper. Place the printed sheet in front of a label sheet, then hold the sheets up to a light to make sure the positioning is correct. Tower inkjet products feed directly from the paper tray of your inkjet printer, just like plain paper. Fan the label sheets before loading them into the paper tray. DO NOT BEND THE CORNERS. Refer to your printer manual for loading and feeding recommendations. Many printers have special instructions for loading labels. 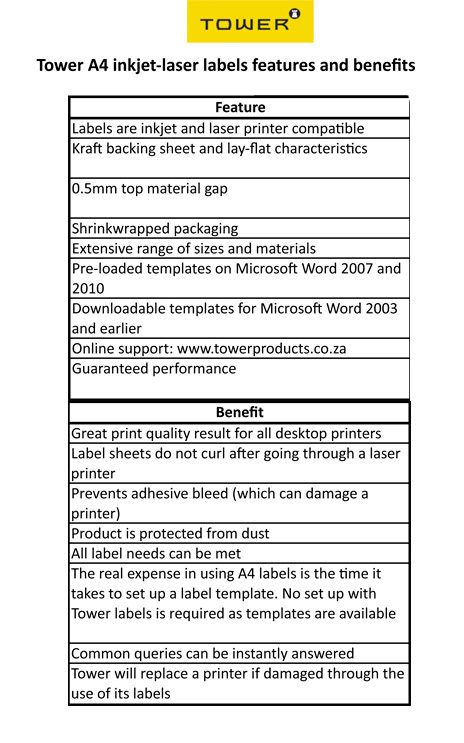 For easier feeding in most printers, place the label sheets in the paper tray on top of 25 sheets of plain paper. Adjust the paper width lever so that it barely touches the edge of the label stack and the labels do not buckle. Printer margins may vary, and in some cases the bottom label may print below the bottom margin of your page. If this happens, use the ‘Printer Callibration’ option in the ‘File’ menu to help you get the best results from your printer ; for instructions, see your user’s guide. If you are not satisfied with the print quality from your printer, check the following Print mode settings – Choose Draft/Economy for fast test prints, Normal/Productivity for everyday use, and Best/Photo for highest-quality results. Shelf life can vary greatly depending on environmental conditions (heat, humidity etc.) but usually 2-3 years. However, if one defines ‘shelf life’ in terms of ‘life span’ inkjet-laser labels have a life span of 10-15 years depending on storage conditions. Avoid folding and excessive handling of the media to protect the material from damage. It is recommended to introduce a plain paper sheet between the printed samples to avoid damages produced by friction between the backside and the print side. What is the Top Retrieval Filing System? The Tidy Files top retrieval system consists of a variety of folders and files, tabs and containers, all designed to enhance efficiency in records management Filing Cabinets. Filing segmentation is achieved through the use of 25 different colour labels, and in some cases through 5 different colour files. This provides for speedy retrieval and replacement of files, and ensures that misfiling is virtually eliminated. What is the Space comparison? 50% time saving resulting in a 40% cost saving due to improved productivity of employees. 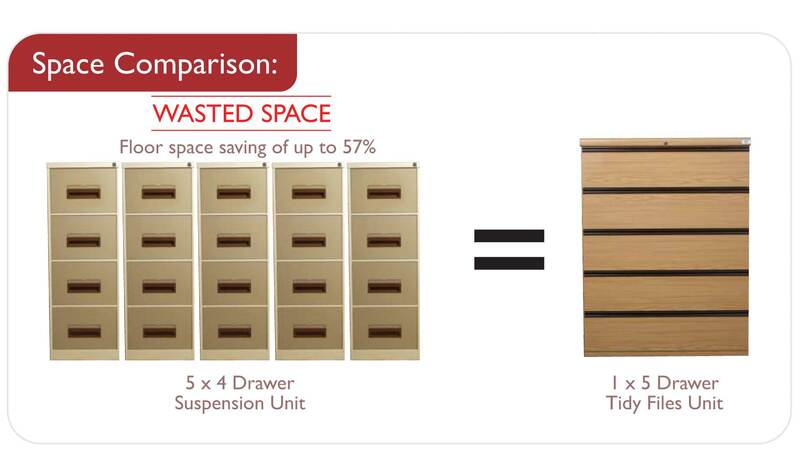 1 Tidy Files five drawer unit replaces 5 four drawer suspension units, creating a floor saving of up to 57%, ultimately resulting in a cost saving for our clients. Enhances the aesthetics of existing offices, as the cabinets are made to match the existing office furniture, with no additional cost to replace furniture to keep a corporate look. Our wood cabinets are the most cost-effective as they cannot collapse and last longer than cabinets without metal frames and anti-tilting mechanisms. Tidy Files offers ongoing support, completely free of charge. Multimedia bulk filing can be mobile and eliminates unnecessary access aisle space. What labels do we offer? A Label identifies which documents are filed in various files. The labels are essential for the setup of a complete and functional filing system. We offer 2 types of labels, Alphabetical and Numberic labels. • Alphabetic laser labels consist of 24 labels per sheet. • The Alphabetic labels are used to name and distinguish each individual file. 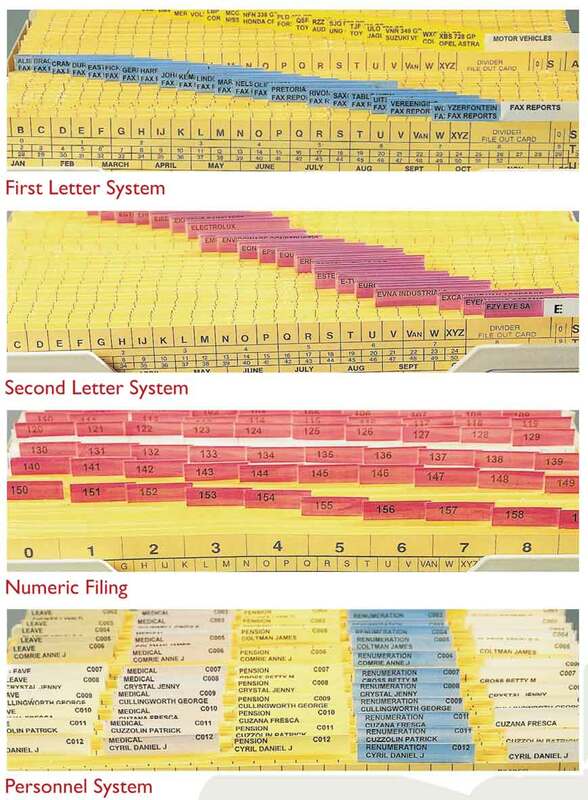 • Alphabetic labels are ideal when using first-second letter filing systems. • Numeric laser labels consist of 40 labels per Sheet. • The Numeric labels are used to number & distinguish each individual file. 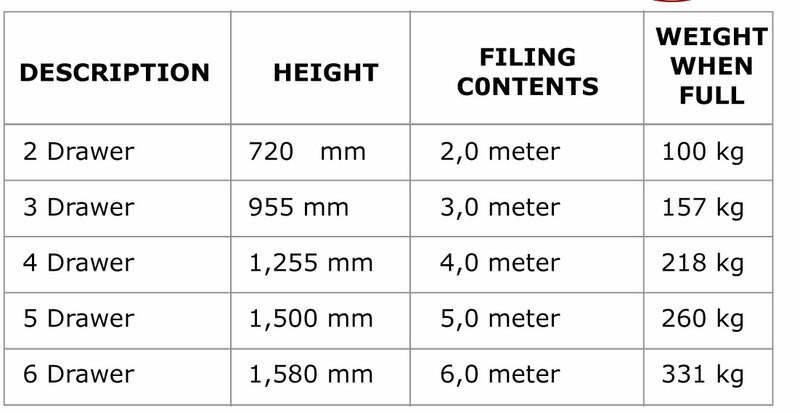 What are the different types of filing systems? The use of 25 different colours of labels and the indices printed on all Tidy Files files, enables a variety of different filing systems to be created, preventing misfiling and saving time in retrieval of the files. What big are the Cabinets? We offer the largest range of Cabinets to suit each individual need. What finishes do we offer on the Cabinets? What handles do the Cabinets come with? Long PVC Handles across the top of each drawer, available in black or brown. Metal handles, available in silver aluminun finishes. What are the most important features on these Cabinets? • The cabinets have been ergonomically designed to ensure maximum use of both floor and filing space. • All our cabinets have a SABS Approval certificate which guarantees long life. • Tidy Files use an imported slides / runners and these can hold up to a maximum of 120kg per drawer. • Cabinets have a central locking mechanism and an anti tilt mechanism ensuring the cabinet will not fall over. Terms and conditions for the Cabinet Warranty? The cabinets have a ten year warranty on the working parts. The warranty is from the date of purchase and is not extended if repairs are done during this period. If the customers moves the cabinet. This might cause the runners to jam because the cabinet is not leveled properly. Any alterations to the cabinet by the customer. Heavy objects on the cabinet - this might crack the top and bend the frame. Loose screws etc. is caused when the customer wants to force open a drawer that is locked or that jams when the cabinet is not level. This is not covered by the warranty, but we normally assist where we can. Another common problem is that the drawers come off the runners because the customer does not pull the drawer forward, but upwards when opening the cabinet. We normally fix this free of charge the first time and explain why this happens, but when it happens again we charge the customer a call out fee. During the first 6 months after the sale of a cabinet we do not charge a call out fee to sort out any problems with the cabinet. After this period there should not be any more problems and if necessary we charge a call out fee after this period when we need to repair a cabinet. Parts are then covered by the warranty. We utilize a cabinet check list for when we delivery the cabinet. What archiving solutions do you offer? The Tidy Files archiving solutions are the largest in the southern hemisphere and cater for A5, A4, A3 and foolscap documentation. The archiving system consists of a variety of different boxes suitable for archiving office records. Our archiving product range adheres to all gazetted archive procedures. The container boxes are modular, stackable, re-enforced with steel, this eliminating need for shelving in a record room. The archive boxes are designed to fit into the containers or onto existing shelving , but with space saving properties incorporated into the design. What service, advice and support do we office? Where do I download the Tidy Files Labelling program from? What is the difference between a pocket and a wallet envelope? A pocket opens on the short side and a wallet opens on the long side. What sealing options do you offer? We offer either ‘gummed flap’ (traditional ‘lick and stick’), and our two self sealing options are ‘Kwikseal’ – our latex flap envelopes which is a press and seal option or ‘Simpli-Stik®’ (peel and seal). Note that the ‘Simpli-Stik®’ envelopes have the longest shelf-life. Opaque is the printing on the inside of the envelope to prevent the contents of the envelope being visible through lighter grammage paper. Also called ‘security print’, in our standard envelopes it is printed in one colour in flexo ink during the manufacturing process. What size is a standard window?